Skins are cosmetic collectibles which visually replace your skin texture. They are disabled by polymorphs. Skins were originally classed as costumes and could not be worn in conjunction with one. 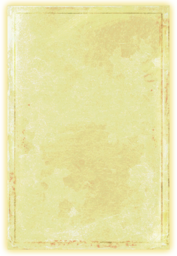 Proudly display your victory in Mazzatun with this daub of glowing and magically-infused amber plasm! Amber Plasm skin worn by a female Breton. Amber Plasm skin worn by male Nord. Acquired by completing the Ruins of Mazzatun Challenger achievement. Arctic Rime skin worn by a male Orc. Arctic Rime is available as an Epic-level reward in Dragonscale Crown Crates, and can be purchased for 40 gems. Feel the uncanny power of Necromancy radiate from your very flesh with the eerie Blackmarrow Skin! It's as creepy as undeath itself, and a great conversation starter down at the tavern. Blackmarrow Necromancer skin worn by a female Breton. Blackmarrow Necromancer skin worn by a male Nord. Awarded for completing the "Scalecaller Peak Challenger" Achievement. Blood. Nirncrux. Iron. Combined with the unholy rites of the Reachmen at the Bloodroot Forge, the result is a clinker-cracked, glowing-hot skin like no other: the Blood-Forged! Available for purchase in the Crown Store for 012001,200 . Bright-Throat Scale is available as a Legendary Reward in the Xanmeer Crown Crates, and can be purchased for 100 gems. It can be seen on various NPCs in Murkmire, such as Xukas. Crystalfrost Skin Scale skin worn by a female Breton. Crystalfrost is an ice-themed skin acquired by completing the "Newly Charitable" achievement, which involves completing 12 New Life Charity Writs during the New Life Festival 2018. It can be seen on various frozen NPCs, such as Drodda's Apprentice, but also affects their armor and weapons. Dead-Water Scale is available as a Legendary Reward in the Xanmeer Crown Crates, and can be purchased for 100 gems. It can be seen on various Naga NPCs in Murkmire, such as Jaxsik-Orrn. Decayed Zombie: the skin condition no amount of Lillandril Moisturizing Lotion can cure! Pairs well with Worm Cult style armor. The Decayed Zombie skin is obtainable from the Hollowjack and Scalecaller Crates. 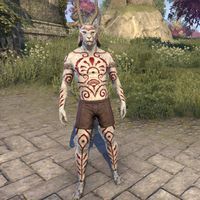 Those who assist in the dark rituals of the Dreadhorn Reachclan must first coat their skin in a chalky whitewash, and then draw scarlet sigils of power upon it in a thick paint mixed of nirncrux and blood. Dreadhorn Shaman skin worn by a female Breton. Dreadhorn Shaman skin worn by a male Nord. Awarded for completing the "Falkreath Hold Challenger" Achievement. 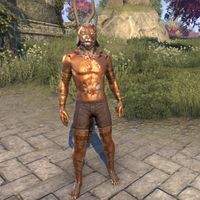 One who wears this skin adopts the eerie appearance of a dro-m'Athra or Bent Cat, an evil ancestor spirit of the Khajiit. Dro-m'Athra skin worn by a female Breton. Dro-m'Athra skin worn by a male Nord. The Dro-m'Athra Skin is acquired by completing Veteran Maw of Lorkhaj scaled to 160. Never trust an alchemist with a Daedric scroll—you might end up with skin that's the color and hardness of Ebony! Unless you think that's a good idea, of course. 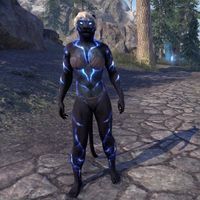 The Ebony Epidermis skin was available for a limited time and has not been available since it's initial release to the store. It was available from August 10, 2017 through August 14, 2017. It is seen on Stonefiends in Vassir-Didanat Mine. Proudly display your victory in the Halls of Fabrication with this sheath of burnished bronze! Fabrication Sheath skin worn by a female Breton. Fabrication Sheath skin worn by a male Nord. Awarded for completing Veteran Halls of Fabrication. 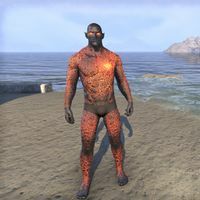 Look like an ever-burning Flame Atronach from Oblivion with the Infernal Epidermis, a smoking-hot skin of fire, ash, and charcoal. 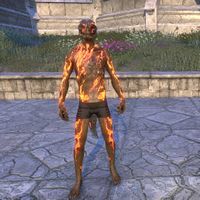 This Apex-level reward is found in Flame Atronach crates. While it appears bright, it does not emit light. It's said that under certain conditions the Maormer, like chameleons, can change the appearance of their skin. Emulate that legendary ability with this blue-scaled Fish Skin. Maormer Fish Skin is an upcoming skin. It is unknown how it will be acquired. The skin can be seen on various Storm Shark NPCs in Sunhold, such as Konnugil the Leviathan. 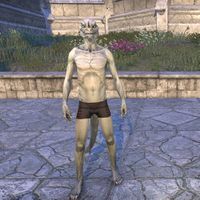 Most Argonians live above ground, where the sun can shine on the leaves of their Hists, but some, strange and reclusive, live in subterranean caverns. Over time their scales grow as pale as marsh mist. 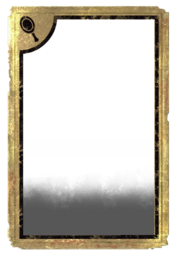 Meridian Purified is a skin found in the Wrathstone DLC. This glowing light-based skin can be acquired by obtaining the "Depths of Malatar Conqueror" achievement in Depths of Malatar. 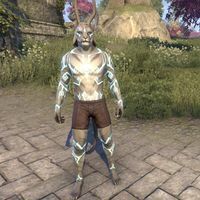 This costume gives the wearer the appearance of those tragic mortals whose will and mentality have been stolen by Molag Bal. Mind Shriven skin worn by a male Orc. Originally sold in the Crown Store for 012001,200 , or as part of the Imperial City Collector's Bundle for 055005,500 . As a murderous beast who lurks in the darkness, to become the color of shadows is only natural. As natural as the blood of the innocents that drips from your claws. Acquired for completing the Moon Hunter Keep Challenger achievement. Shine with the radiance of the purified Saints of the Asylum Sanctorium with this sheen of silvery skin. Sanctified Silver skin worn by a female Breton. 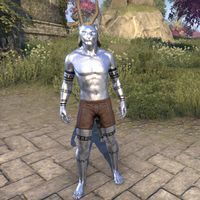 Sanctified Silver skin worn by a male Nord. Acquired by defeating Saint Olms, Saint Llothis, and Saint Felms in the same fight in Veteran Asylum Sanctorium. Donning this costume gives the wearer the guise of one of the Soul-Shriven, Molag Bal's slaves in his Oblivion plane of Coldharbour. Soul-Shriven Skin skin worn by a female Breton. 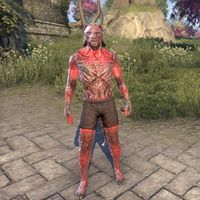 Soul-Shriven Skin skin worn by a male Nord. A Soul Shriven skin can potentially be earned by completing the Barathrum Centrata event in the Imperial Sewers, as part of the Imperial City DLC. It is a very rare drop of the event's final boss, the Simulacrum of Molag Bal. Kissed by spider, Spiderkith, Daedric legend, tale, and myth! Spiderkith skin worn by a female Breton. Spiderkith skin worn by a male Nord. Acquired by completing the Cradle of Shadows Challenger achievement. Z'Maja's powerful magic infuses those it touches with a tinge of shadow. Z'Maja's Shadow Skin worn by a female Dunmer. 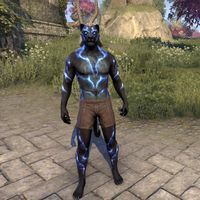 Z'Maja's Shadow Skin worn by a male Dunmer. Acquired by completing the Cloudrest Vanquisher achievement. It is worn by the Welkynar shadow clones in Cloudrest. This page was last modified on 21 April 2019, at 10:13.